Each year college and university students, on- and off-campus, experience hundreds of fire-related emergencies nationwide. There are several specific causes for fires on college campuses, including cooking, intentionally set fires, overloaded power strips and open flame. 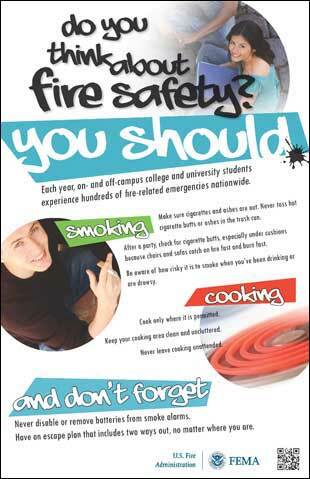 Overall, most college-related fires are due to a general lack of knowledge about fire safety and prevention. For most students, the last fire safety training they received was in grade school, but with new independence comes new responsibilities. It is important that both off-campus and on-campus students understand fire risks and know the preventative measures that could save their lives. 83 fatal fires have been documented that occurred on a college campus, in Greek housing or in off-campus housing within 3-miles of the campus – claiming a total of 120 victims. · 33 of the fires the cause was never determined – or the cause was not available at press time. These fires claimed 49 victims. Make sure candles are in sturdy holders and put out after each use. Use flameless candles which are both safe and attractive. Make sure cigarettes and ashes are out. Never toss hot cigarette butts or ashes in the trash can. Use deep, wide ashtrays. Place ashtrays on something sturdy and hard to ignite. It is risky to smoke when you have been drinking or are drowsy. Get low and go under the smoke to escape to your safe exit. Feel the door. If it's hot, use your second way out. Practice your escape plan. Always have two ways out. 2. Are there at least two ways to exit your bedroom and your building? 3. Do the upper floors of the building have at least two interior stairs, or a fire escape? 4. Is a sprinkler system installed and maintained? 5. Are the existing electrical outlets adequate for all of the appliances, computers, printers and electronics that you are bringing – without the need for extension cords? 6. Are there EXIT signs in the building hallways to indicate accessible escape routes? 7. Does the building have a fire alarm system installed and maintained? 8. Has the buildings heating system been inspected recently (in the last year)? 9. Is the building address clearly posted to allow emergency services to find you quickly in the event of an emergency? 10. Does the sprinkler system or fire alarm system send a signal to the local fire department and/or campus security? According to the U.S. Department of Education, there are approximately 18,000,000 students enrolled in 4,100 colleges and universities across the country. Since the 2000 academic year, 86% of the campus-related fire fatalities have occurred in off-campus housing where approximately two-thirds of students live. In cases where fire fatalities have occurred on college campuses, alcohol was a factor. There is a strong link between alcohol and fire deaths. Alcohol abuse often impairs judgment and hampers evacuation efforts. Misuse of cooking appliances, overloaded electrical circuits, and extension cords increase the risk of fires. Install smoke alarms and an automatic fire sprinkler system in every dormitory room and every level of housing facilities. Make sure electrical outlets and power strips are not overloaded and extension cords are used properly.